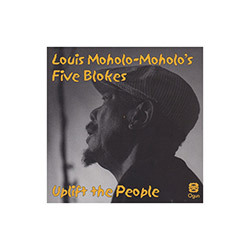 In 2014, the Louis Moholo-Moholo Quartet released a studio-recorded album on Ogun, entitled Four Blokes. Joining the veteran South American drummer were three UK-based players with whom he shared plenty of experience; saxophonist Jason Yarde had played with Moholo-Moholo since he toured South African in 1992-3 with the drummer's group Viva La Black; alongside saxophonist Evan Parker and pianist Steve Beresford, bassist extraordinaire John Edwards and Moholo-Moholo have been the rhythm section of the quartet Foxes Fox since 1999; pianist Alexander Hawkins had been a member of the Louis Moholo-Moholo Unit since 2008, and in 2011 the pair recorded the excellent duo album Keep Your Heart Straight for Ogun. In April 2017, during one of the drummer's occasional visits to London, the quartet played a gig at a packed Caf� Oto, being joined by second saxophonist Shabaka Hutchings, himself a member of the Alexander Hawkins Ensemble, thus justifying the name Louis Moholo-Moholo's Five Blokes. This recording dates from that evening and captures its electric atmosphere. As Hawkins comments, "There's a particular kind of joy whenever I get to play with Louis, and never more so than with the Blokes. More than anything, I think it's a joy in the collective experience with the audience." Although the album lists eleven compositions, in practice they play seamlessly, with one segueing into the next without a break for applause or stage announcements. The overall effect is of a band with so much music bursting out of them that they have no time for such niceties. The five players all play together most of the time, complementing one another perfectly throughout, with Yarde and Hutchings operating as a saxophone tag team. The compositions themselves cover a period of over fifty years, taking in pieces recorded by Moholo groups including The Blue Notes, Brotherhood of Breath, Viva La Black and his quartet on Four Blokes.The latter two, Dudu Pukwana's "Angel-Nomali" and the drummer's own "For the Blue Notes", emphasize the different energy and excitement levels in a live concert compared to in a recording studio. As John Edwards comments, "This music is real. There is no other way for it to be and we love to do this." Yes, Uplift the People is a very fitting title. Guaranteed to thrill.